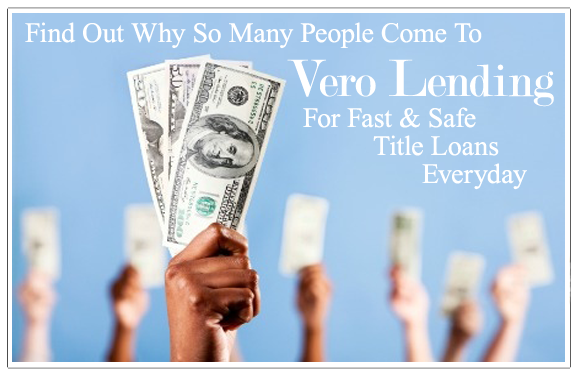 Vero Lending prides itself on providing fast and safe title loans to our clients. We understand that times are tough and that many people are struggling to stay afloat during uncertain times or lack dispensable income to treat themselves. We’re here to help you secure the most money for your vehicle with the lowest rates possible. You even have up to a year or even 36 months to pay back the loan. With no credit check and instant approval, Vero Lending gets your cash quickly and safely. Our agents even come to you, whenever and wherever is convenient, to appraise your vehicle. We service title loans in many areas, so please review our Locations to find an agent near you. The title loan process only takes minutes. And the best part is you get to keep driving your vehicle! We service car title loans in cities throughout Florida, Georgia, Ohio, Texas and the Southeast. All transactions are set up on your collateral, not your credit history or score. There is No Credit Check with Vero Lending. All you need is a clean vehicle title to get the cash you need today. Vero Lending does not require insurance of any kind to get a title loan. Most other lenders require clients to have at least collision insurance on their vehicle before making a loan, but we don’t require insurance at all. Why would you sell you car for quick cash during a crunch, when Vero Lending provides a better alternative to selling your car by taking out a fast and safe title loan. With Vero Lending, you get the cash you need right away and you keep your car. With Vero Lending, we go at your pace throughout the process. Our agents will come to you to appraise your vehicle. Once the loan is approved, our agents will drop of your check right to your hands. You drive away away in your car and you maintain the use of your vehicle throughout the term of the title loan. Once the title loan is paid off, in a given time set by you and Vero Lending together, we’ll immediately relinquish the lean on your vehicle. People from all walks of life come to Vero Lending for their short-term money solution. In fact, a fair portion of American drivers take out car title loans, so you are not alone. Chances are, you know someone who has come to us for a title loan. Many clients are people who have an unexpected and sudden need for cash due to common financial challenges, like: medical emergencies, home repairs, unexpected bills, etc. Individuals who have low credit scores, which cause them to not have access to traditional credit-based lenders, like banks and credit card companies. Other clients are people who need cash immediately and have great credit, but don’t have time to wait for a bank to approve a loan; which can be up to 45 days. Small businesses and start ups with an immediate need for short-term working capital.